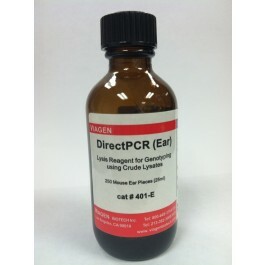 DirectPCR Lysis Reagent (mouse ear) mus musculus	murine DirectPCR Lysis Reagent (mouse ear) detects proteins from variouse species most likely human. 401-E 25ml (250 ear pieces). 402-E 50ml (500 ear pieces).